On Sunday, a friend came over and helped us complete the final stage of installing our new hot water heater, “The Iron Giant” (see “The Iron Giant” Comes!). 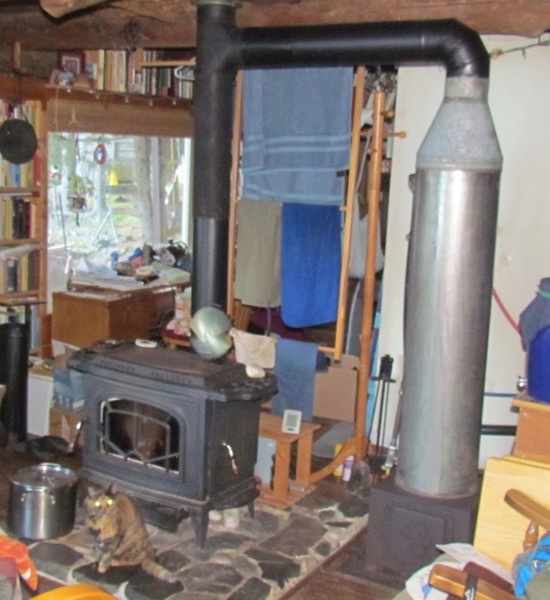 We had to drill out some seized bolts on the wood stove’s flue spigot so that we could reconfigure our chimney, raising the Tee to the ceiling to allow a 90° connection for the water heater flue (yes, fellow homesteaders, we know that this is one of the worst chimney connections possible. People have been warning against it, yet using it for years). Once we had that taken care of, and with the connections well tightened and proven leak-free (see “Paging Doctor Frankenstein . . .”), we went to bed, eagerly anticipating clean bodies and dishes come morning. And yet, it wasn’t going to be that easy . . . . The new water heater in place, ready for the next surprise. Note aluminum heat shield on ceiling (Photo: Mark A. Zeiger). I started a fire in the freshly-blacked wood box, planning to slowly heat water to shower temperatures this first time. All went well, until I opened the box to stoke the fire, and noticed sizzling moisture. At first, I thought that the wood I used was quite wet, then I realized that it was too wet! Water fell on the fire in fat droplets from somewhere above. Our new flue configuration to accommodate “The Iron Giant” (Photo: Mark A. Zeiger). I grabbed a headlamp and looked inside the box, at the ceiling of the chamber, where the stainless steel tank joined the fire box. 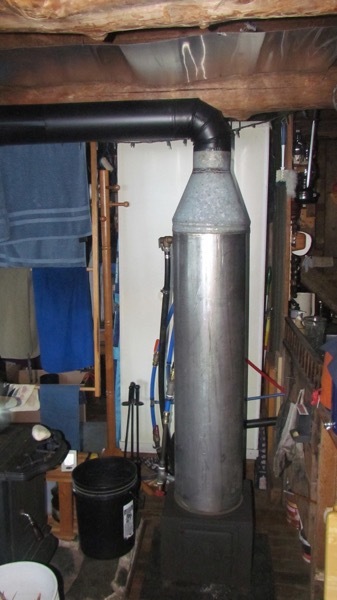 A quick orientation: the water heater consists of a stainless steel tank with six tubes running from top to bottom. The tubes, about 2 inches in circumference, form chimneys through which smoke and heat from the fire box rise, warming the water in the surrounding tank. I saw water dripping from a completely wet ceiling. We appeared to have leaks in the heater! What a disaster. How had we not seen these leaks when we filled the tank with water at the roadside? Why didn’t we take the time to build a fire in the fire box then? How would we possibly repair this? And, why was water dripping from all six tubes? That last gave me a straw of hope to grasp fervently. I stoked the fire higher, hoping to overcome the water at least long enough to grab some showers and maybe wash some dishes. We kept a heartsick vigil on the drips as we stoked. 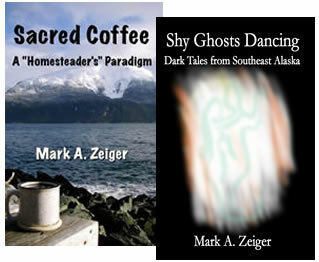 After far too long, the water dissipated, the drips stopped. Here’s what I think happened: I’d filled the water tank two days previous, to check the plumbing joins. We had a fire that day, but let it burn out in the evening, and made no fire the next morning, ahead of the flue reconfiguration. The cabin got down to below 55° during that time. The icy cold water in the tank, and the low cabin temperatures, no doubt produced a lot of condensation in the tubes, as it did on the outside of the tank. When we started the fire, that condensation warmed up as the smoke fed it particulates—precisely the minute nuclei around which precipitation forms. Six 4-foot tubes of that diameter surely produced enough moisture to rain down on the fire briefly—although “briefly,” as Einstein observed, can be a relative term, particularly if you’re staring at a major “disconnect/haul-back-to-town/beg-a-welder-to-repair/reverse-process-IF-successful” situation . . . .
That’s our theory anyway. We enjoyed our first thorough, leisurely hot showers in weeks, and washed every dirty dish in the cabin. At one point, I realized that all the work to that point would prove worthwhile, even if the heater did leak, for those moments of bliss. After the fire died down, I placed a newspaper on the box floor. Frequent checks since then show no hint of moisture! We’ll see what happens when we make a new shower tomorrow. Even after that alarming debut, we’re thrilled with the new heater. This morning, almost 24 hours since we first heated the water, we still had warm water for hand washing. We feel confident that we can control the condensation problem if it persists. We have a new hot water heater! Homestead life is good! Well done. Persistence and patience are what you folks are made of. John and Mary, your faith in us, and encouragement is ALWAYS appreciated!